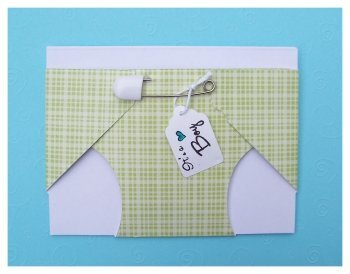 The files provided on this page are templates to use in creating the diaper baby shower invitations shown above. I have provided a free printable template to re-create the diaper shape made from paper. To use this template simply print it out onto the back of your chosen invitation paper and cut along the lines to make little handmade paper "diapers". I have also provided a downloadable SVG file for all of you who like to use a electronic die cutting machine in conjunction with the Sure Cuts A Lot software. You can download the diaper invitations template for just $1.00. Download and print the Baby Shower Diaper Invitations Template. The printable template files are in the form of printable PDF file. You will need Adobe Reader (the latest version is recommended) installed on your computer in order to open and read this file. You can get Adobe Reader here. (a new window will open so you can download without leaving this page).